I have been trying to fix in my head an image of what “home for the holidays” means to me. It’s pretty easy to remember what it meant for me as a child. I have lots of sepia-toned memories — you know the ones that have been pushed so far away by time that they are more memories of memories now. I can see myself as a five-year-old, up too early on Christmas morning to wake my parents yet. I sneak into the living room to check to see if Santa had come. 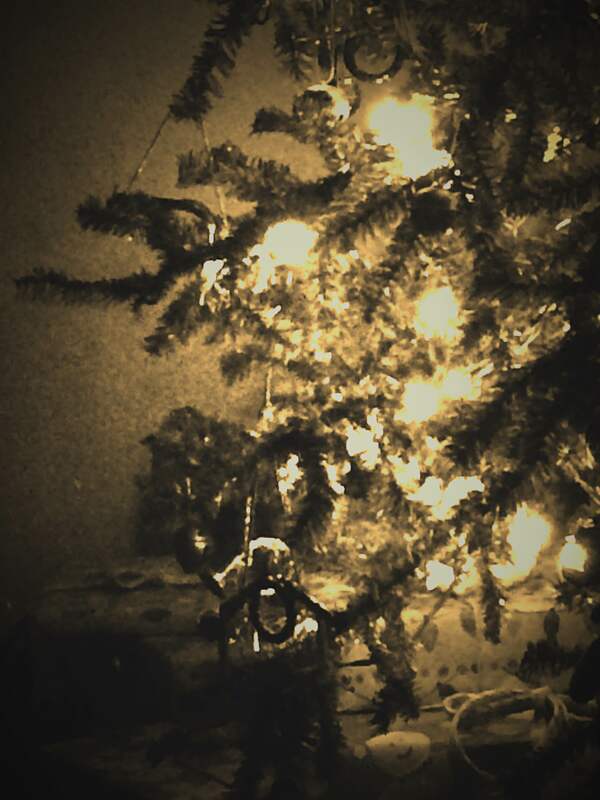 I sit there on the floor, in the quiet and watch the lights twinkle on the tree and drink in that sweet anticipation. I was sure that there is something special, just for me, beneath that tree. I think that year it was purple cowboy boots. I can’t remember asking for them, but I can remember opening them. They fit just right. And I know I must have liked them because I have a picture at Easter-time that year of a little girl with an Easter basket – wearing a frilly white dress with a satin sash and purple cowboy boots. But finding an appropriate image as a adult is a bit more difficult. Its so much more complicated now. For example – where is “home?” Is it Tim’s folks house, or my folks? Mine have lived in six different houses since that early memory. Or is it my own house this year — and are the bathrooms clean? Now I share the responsibility of gifts under the tree and food on the table and schedules and errands and, yes, even Advent services. Do you ever wonder, as you sit on the couch late on Christmas day, with the dishes in the sink and scattered bits of wrapping paper on the floor, did you ever wonder if you missed Christmas? If it was coming and coming – and then it was over. Sometimes I think that it may be because we try too hard to fit the holy into that day. You know, that’s the root of the word “holiday” – holy day – and we take our responsibility seriously and try so hard to buy just the right gifts and create just the right memory for our kids. And we plan and we go and we fix and we fiddle. We cram so much in, trying to make it special. Yet the special is not in the tinsel. In fact, if I would just stop for a moment I would remember that it is not my responsibility to bring the holy to this day. It is already there. That’s what it is all about. That’s the miracle of it all. Even when your plans don’t work out right and that toy is sold out and you burn the cookies and the innkeeper doesn’t take reservations. Even then the holy will come – even a stable can be a holy place. And it is the whisper of that holiness that nurtures the anticipation. . .the sweet anticipation that comes in the dark of the living room, watching the lights on the tree. There is something just for you beneath that tree – and for each of the ones that you love. You can be sure. You may not remember asking for it, but do remember to open it. It fits just right. And you can wear it all the way to Easter. This entry was posted in scripts and tagged blogging 101, christmas, insight, memory, stories by celia. Bookmark the permalink.